Do you have any old photos of this building? If you have any old photos from any time period, inside or out or of the people who worked here, please let us know. 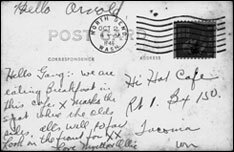 There are surprisingly few photos to be found and we would like to scan them for posterity and to share on this web site. 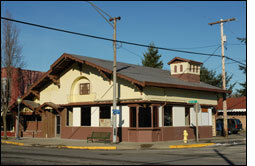 The original building hiding within the former Hangchow Chinese Restaurant in North Bend is a small concrete bank built in 1910. 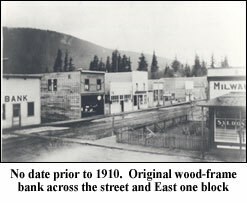 Earlier downtown photos show a predecessor wood frame bank building with a false front on the opposite side of First Avenue, one block further east. 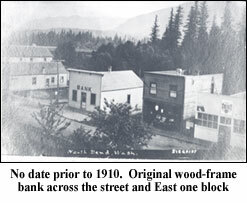 That was a private bank, first organized by Issaquah banker W.W. Sylvester in 1908. 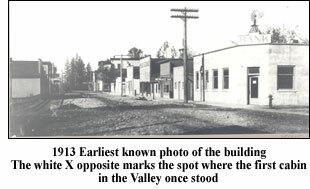 By 1911, the new concrete bank with its distinctive corner entrance had been erected across the street and appears on Sanborn Co. insurance maps of that year. 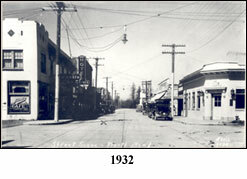 Sylvester’s Bank was incorporated in 1913. The concrete bank was purchased by C. Beadon Hall and his sister Isadore Hall in 1923. 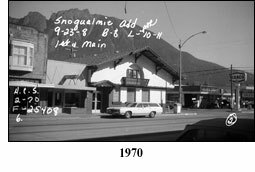 It became part of Beadon's Washington State Bank system, including banks at Duvall, Tolt and Snoqualmie. 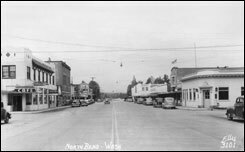 The North Bend Post reported in October of that year that "This Bank is Being Built Up." The bank was remodeled in 1929 with a heavy classical cornice, moldings above the corner entry and ornamental lanterns. 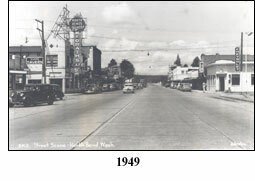 When the Sunset Highway (now North Bend Way) was widened through downtown North Bend in 1941, the bank received compensation for relinquishing land in the right-of-way, and a sizeable amount for jacking-up and moving the concrete building some thirty feet to the north. 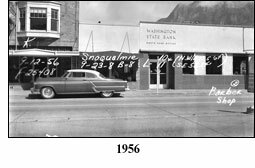 The bank corporation was sold to Seattle First National in the 1950's and Beadon retired to his home in Snoqualmie. A second major remodel took place in 1949, when the cornice was stripped away and replaced with a flat band of stucco and facing stones were applied around the base of the building. 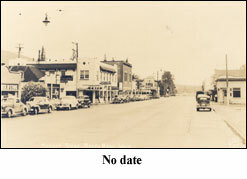 The corner door was removed and replaced with a fixed window and a new entrance constructed along Sunset. 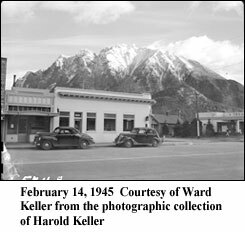 Just next door to the bank, a modest wood frame jewelry shop built in the late 1920's, owned by D.H. and Ethel Phillips was also moved back to make way for the highway. These two buildings were ultimately combined in a design sense in 1970, under the ownership of Hugo M. Loveland. With his bank building, Loveland was the first downtown property owner to implement the community's new Alpine motif. The bank was combined with the adjacent wood frame barber shop to the west under one massive gabled roof with a deep overhang and brackets, all in the Alpine mode. The 1970's roof line and façade disguises the separation between the two structures. Greatly altered with applied Alpine ornament, this building bears little resemblance to its original modest beginnings as a single-story bank of concrete. In its earliest configuration, the bank featured a flat roof, a corner entrance and little or no ornamental detail. The bank building has served as the Hangchow Chinese Restaurant since 1972. In August of 2005, Hugh Loveland passed away at age 91. 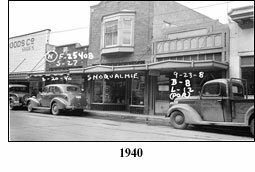 The building was sold to David and Lisa Cook in May of 2006, which began the next chapter of this 96 year old building.